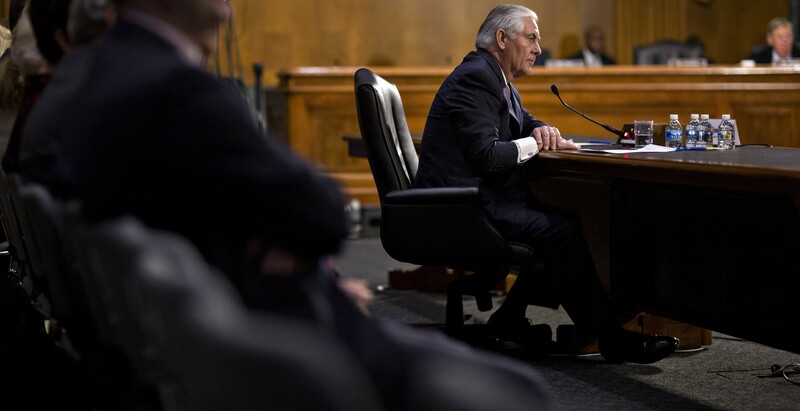 In comments expected to enrage Beijing, Rex Tillerson told his confirmation hearing before the US Senate Foreign Relations Committee that China's building of islands and putting military assets on those islands was "akin to Russia's taking Crimea" from Ukraine. Asked whether he supported a more aggressive posture toward China, he said: "We're going to have to send China a clear signal that, first, the island-building stops and, second, your access to those islands also is not going to be allowed." The normally restrained Reuters said Tillerson had 'set a course for a potentially serious confrontation with Beijing'. Reuters is not exaggerating. Short of a military blockade, it's hard to see how the US can stop Chinese island-building and deny Beijing access to the islands it has already built. I see China observer Patrick Chovanec is already saying Tillerson misspoke, while my colleague Euan Graham suggests the comments may have been a 'trial balloon'. Ankit Panda's piece for The Diplomat explains just why these comments potentially represent such a big departure from settled US policy and even from Donald Trump's recent statements. My point is a basic one about correlation and causation. We can't know that US behaviour has been interpreted in Beijing as deferential, and even if it was, we don't know that this influenced China's behaviour. It's possible, as I implied in my tweet, that alleged US deference may have actually worked, and China would have been more assertive in its absence. Or maybe US behaviour has made no difference to Chinese behaviour at all. I don't think the evidence is strong enough to know either way, and although I defer to Jaishankar on the subject of Chinese strategic culture, his other indicator - that Chinese assertiveness increased after 2008-09, when Obama took office - is unpersuasive because it does not show that alleged US inaction caused China to become more assertive. Even if Tillerson and the Trump team walk back these comments in coming days, they will no doubt be remembered in Beijing, where it is unlikely the US is seen as being inactive or deferential. More likely, China sees a major-power rival in its backyard, which has a powerful military presence and a tight alliance network. No world power – including the US – has long accepted subordinate status in its own region, and the Chinese are unlikely to be any exception. Far from seeing the US as supine, they are probably frustrated at the seeming desire of US governments – Republican and Democrat – to defy such history. Beijing's leaders may also be asking themselves if the US is in a strong historical position to judge China's territorial ambitions in the South China Sea. When they look at the US presence in Guam, Hawaii, Japan and Korea, they may ask how the US came to enjoy such a favourable strategic position in the Asia Pacific. Was it by observing the rules-based order? Mahathir redux, Russian military exercises and Taiwan's pacific allies: The week that was on The Interpreter.